The Spring House is a project created by the Lemanski architect team in Krakow, Poland. This daring and stylish home got its name from the way the roof's axis is rotated 20 degrees relative to the axis of the house, making for a slightly twisted design in which one wing of the room extends down further than the other – just one of the many interesting and avant-garde design elements of this home. This off-kilter design allows the roof to accommodate a garage (to the right) under its wings, while exposing the glass-walled living room (on the left side) to premium sunlight. With a living room made of glass, an expansive backyard pool, an impressive facade, and bold style statements throughout, this contemporary wonder is a stylish sight to behold. The home has been built very recently, but the yard relates a more established look, featuring an eclectic blend of garden features from tropical grasses to fuzzy evergreens to the miniature, well-groomed tree that sits in a Japanese-inspired garden on the right. Despite the fact that the facade of this home was obviously design to stand out, it gets a healthy dose of cover – and context – from the lush, well-designed greenery that tightly hugs the home. This patchwork pattern certainly makes an interesting statement! 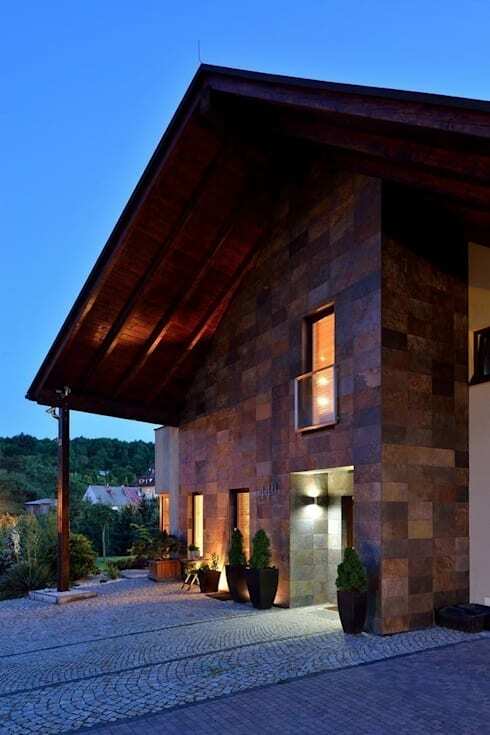 Here, rusty browns and reddish tans cover the front of the home in a unique blending of earthy and geometric elements. With so much happening in the rich tones of the roof and walls, it's easy to miss the intricate brick patterns on the patio that lend an additional pattern to the mix. These architects love the beauty and spontaneity of asymmetrical design – you can see that they've made a subtle shout-out to their off-kilter roof design with the placement of an off-center door, and asymmetrical topiaries to frame it! Placing two of these topiaries on one side brings a sense of determination and purpose to this asymmetrical design, helping the overall layout to look intentional. This home's back appears to have been sliced away in order to fit a large outdoor patio under its roof! With such a large awning, this outdoor space could almost pass for a four-seasons porch. Complete with an assortment of lawn chairs and tables on an elevated deck, this patio enjoys a prime vantage point for looking out over the calm blue waters of the pool. 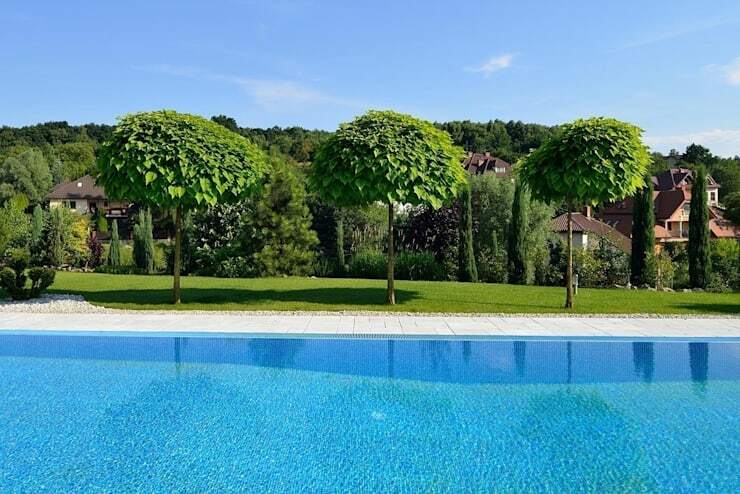 This simple design is about as relaxing as it gets – three perfectly shaped trees mark the boundaries of the pool area, providing a bit of shade for someone who wants to rest out of the sun, while the wide pool fans out below. With no fence surrounding it, the pool area is given some additional privacy by way of the various trees and shrubs that dot the edges of the property. 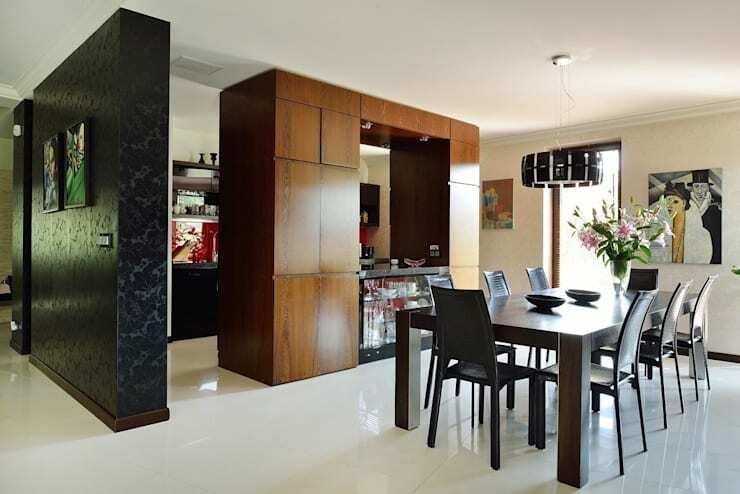 The geometrical patterns that covered the front of the home have been continued in a bold and blocky way in this daring dining room and kitchen area. Thick rectangles are found just about everywhere you look, from the legs of the table to the black partition wall to the hunk of wood that comprises part of the kitchen cabinetry, as well as part of the dining room wall. From the modern art decorating the walls, you can tell that this home was designed with a love of all things contemporary. One notable aspect of this half-open, half-closed design is the way the polished white floor seamlessly connects all of the spaces, creating a smooth canvas that provides breathing space for the bolder, more defined elements of the room, such as the thick partition walls. If you like this dark and bold colour statements, explore the possibilities and rules for adding darker colours to your home with this ideabook. Not only is this living room extremely well-lit with the natural sunlight coming in through the wall of windows, this living room also plays with light by featuring a bold, oversized reading lamp as the central lighting fixture in the room. It's the shape and style of something you might see on a desk, but it's been blown up to an extraordinary size – it's amazing how a simple play on size can bring such an altered sense of scale to a room. Although this living space sits very close to the dining area and kitchen, the living room is given a sense of space all its own by the use of a strip of wooden flooring that marks the living room boundaries. Not only does this give the room a sense of separation, but the wooden material creates a warmer, earthier tone in a space that you expect to feel comforting and relaxing. With a warm hearth and plush rug adding more warmth and softness to the room, this living room takes on a completely different tone than the nearby dining area. Here, a staircase is fully visible through the glass wall running on the right side – instead of creating a cramped hallway, these architects have opened up a typically closed space by using a transparent material. 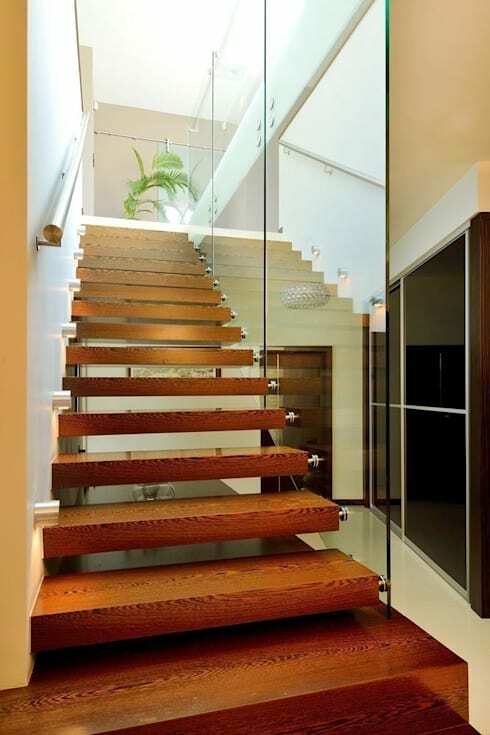 With light passing through the glass as well as the openings between the steps, this staircase has become a well-lit and stylish ascent! 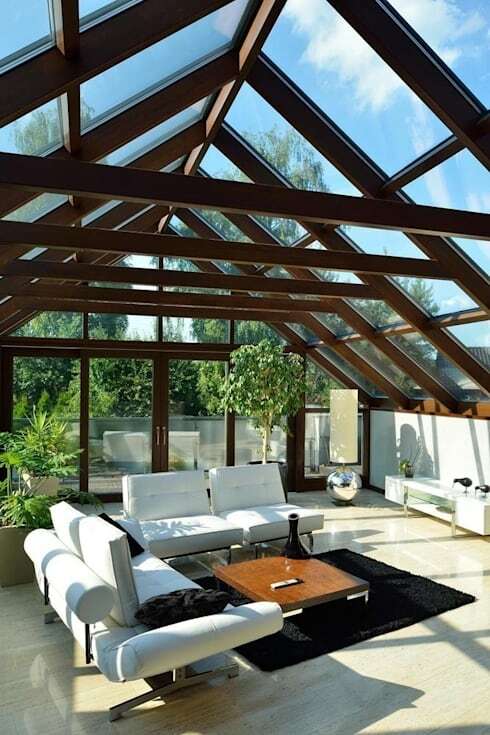 With walls and ceilings like this, you might be expecting a greenhouse or conservatory – here's the low-maintenance version: a glass-walled living room! Perfect for entertaining under the stars (even during the colder months), this glass-walled living room features a few sofas for friendly conversation, as well as access to a balcony for grabbing some fresh air. This unique indoor space has all the benefits of being in nature without any of the maintenance or fuss, like sweeping off leaves and replacing weather-worn cushions. Loving the feel of hybrid indoor-outdoor spaces? Take a tour of this minimalist hybrid wonder!